From bedrooms, to playrooms to bathrooms, Benjamin Moore offers endless options when it comes to designing your child's favourite space. Childrens' rooms are the ideal place in your home to be more playful with colour and to let your, and their, imaginations run wild. 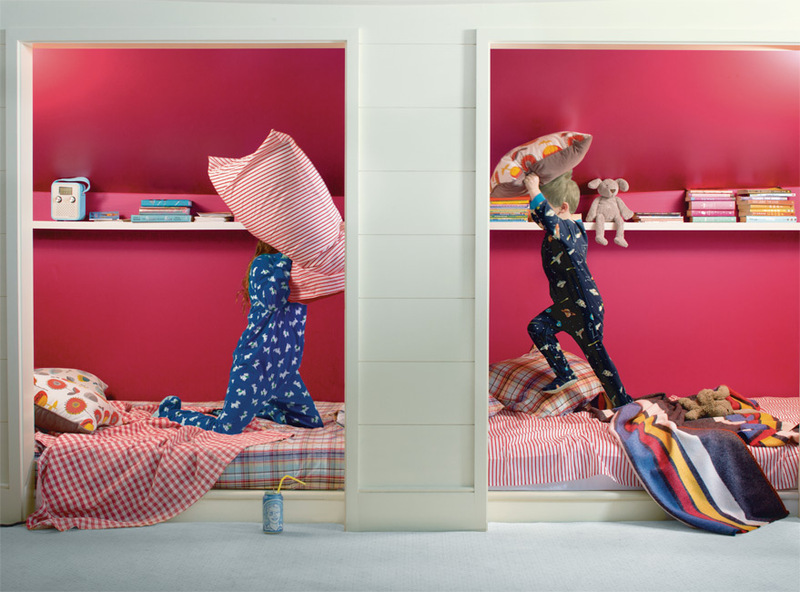 From dreamy pastels to energetic brights, let us inspire you to create the room of your child's dreams. Walls - Clearspring Green HC-128, Natura Flat. Drawers - Billowy Down 2064-70, Natura Semi-Gloss. Woodwork - Cotton Balls 2145-70, Natura Semi-Gloss. Walls - Rosy Blush 2086-30, Natura Flat. Woodwork - Gray Owl 2137-60, Natura Semi-Gloss. 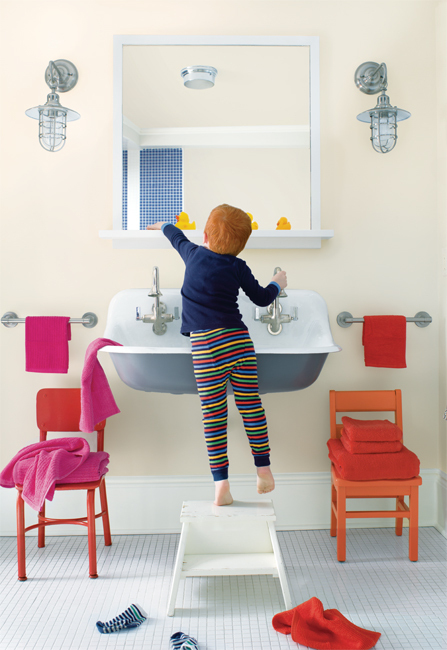 Invigorate your child's favourite space with colours that make a statement. 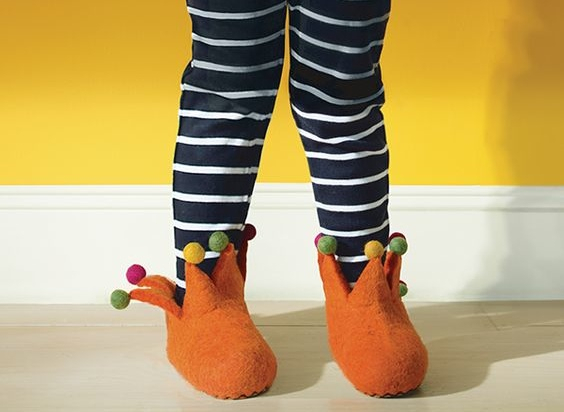 Ask children what colour they want for their room, and big, bright hues top the list. Knowing that this is the space where they sleep, study and play�balance is the key. A colour like Yellow Highlighter 2021-40 is fabulous and bright, and can be softened by Cotton Balls 2145-70 on woodwork and complemented by Downpour Blue 2063-20 as an accent. Blend these saturated tones with neutrals, like greys and beiges, for bedding, pillows and other room d�cor. Walls - Yellow Highlighter 2021-40, Natura Flat. Accent wall - Downpour Blue 2063-20, Natura Flat. Woodwork - Cotton Balls 2145-70, Natura Semi-Gloss. 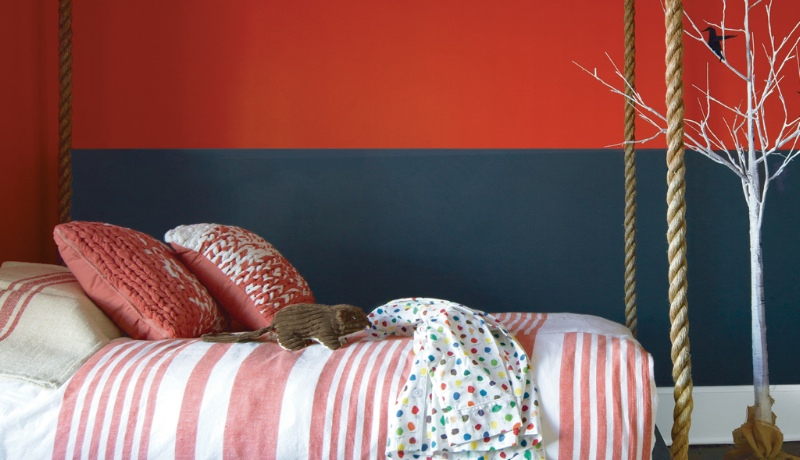 Paint your child's room with a colour they'll never grow tired of. To align a child's room alongside their growth spurts, consider reserving bold colours for room d�cor or furniture, allowing a practical neutral or pale hue on walls to stay tried and true, year after year. Walls - Bird's Egg 2051-60, Natura Flat. Ceiling - Iceberg 2122-50, Natura Flat. Woodwork - Ice Mist OC-67, Natura Semi-Gloss. Paint your child's room in a way that allows them to express their creativity. 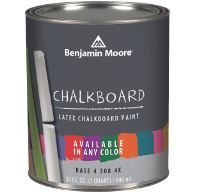 Our Chalkboard Paint is available in Benjamin Moore's 3,500+ paint colours�so no matter what colour the room, you've got a huge array of coordinating colour options. Walls - Waterfall 2050-50, Chalkboard Paint. Ceiling - Blue Bonnet 2050-70, Natura Flat. Woodwork - Ice Mist OC-67, Natura Semi-Gloss. Use more than one colour to create a complimentary theme the both of you will love. There's chemistry between colours on opposite sides of the colour wheel, known as 'complementary colours' in colour and design parlance. Complementary colour schemes that include primary or bold colours are said to create excitement or high energy (think sports team jerseys). Explore how these types of happy colour unions; purple & yellow, blue & orange, can infuse any size room with a sense of whimsy, especially if you opt for deep, primary colours. Complementary colour schemes can be a bit too bold for some, so using a primary with a lighter or darker complement offers a more subtle option. Walls - Autumn Cover 2170-30, Natura Flat. Window frame - Evening Dove 2128-30, Natura Semi-Gloss. Woodwork - Snow White 2122-70, Natura Semi-Gloss. Upper wall - Million Dollar Red 2003-10, Natura Flat. Lower wall, Witching Hour 2120-30, Natura Flat. Woodwork - Snow White 2122-70, Natura Semi-Gloss. 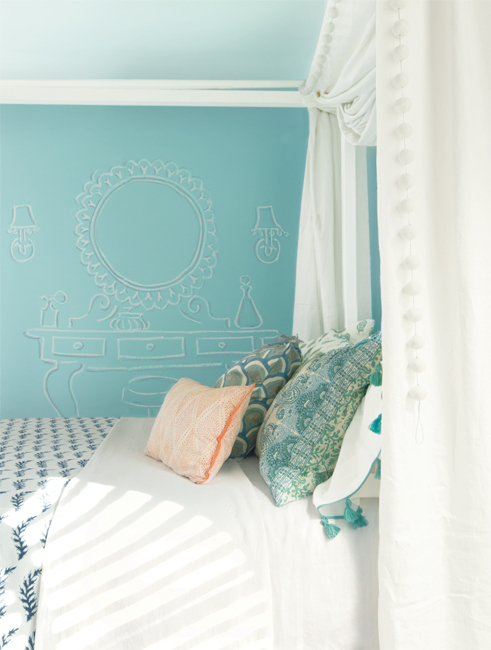 Bring playful hues into your child's room to reflect their personality. Make a piece of furniture more kid-centric by reviving it with a fresh coat of paint. Colourful accent furniture can provide a smile-worthy pop of colour in an otherwise colour-neutral space. Our Advance® water-based paint can be used on furniture*, cabinets and woodwork to provides a durable and beautiful finish. Walls - Pink Damask OC-72, Aura Bath and Spa. Left chair - Million Dollar Red 2003-10, Advance Satin. Right chair - Autumn Cover 2170-30, Advance Satin. Ideal for people with asthma and allergies, or for anyone wanting to get a room back into use as quickly as possible, Natura® is virtually odourless, and, having gained a zero emissions rating*, has been certified as Asthma and Allergy friendly� by the Asthma and Allergy Foundation of America**. 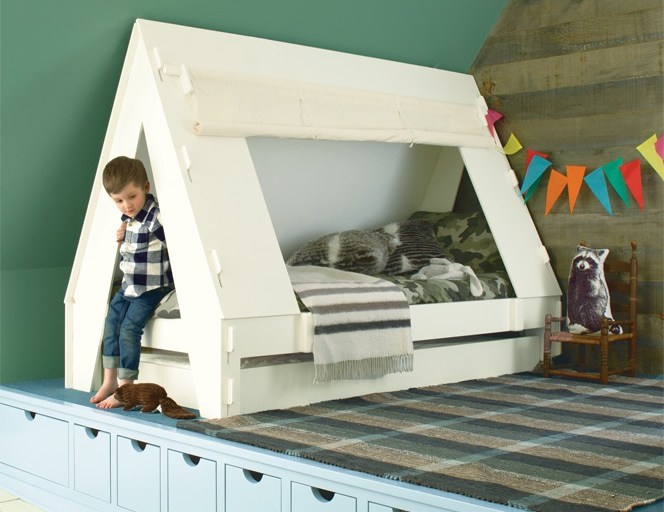 For more fabulous kids' room schemes, visit our website. We will shortly have a copies of the brand new Benjamin Moore Kids colour card. If you would like to be sent a copy, once they are available, click the link below. Available to UK residents only. * Zero emissions - No VOC emissions detected according to CDPH/EHLB/Standard Method V1.1, 2010. Measured at 4 hours after application. **The asthma & allergy friendlyTM Certification Program independently tests and identities consumer products that are more suitable for those living with asthma and allergies. For more information about the asthma & allergy friendlyTM Certification Program, please visit www.aafa.org/certified.